Yes, I do love sushi. But Japanese cuisine is more than that! Have you ever tried okonomiyaki, for example? Harapeco is one of the few places in Berlin that serves this delicious dish. Okonomiyaki is sometimes called ‘Japanese pancake’ or ‘Japanese pizza” Although the concepts might be similar, I find this somewhat misleading: okonomiyaki is a very particular dish whose flavors are, in my opinion, not comparable to any common. The main ingredients for Okonomiyaki are cabbage, eggs, flour and dashi (fish stock). Mixed up to a dough and fried, they make up the thick, fluffy base. This is then topped with different kinds of ingredients such as sea food, meat or egg. Some sauce and katsuobushi (thin flakes of dried and smoked bonito fish) on top and it’s ready to enjoy. 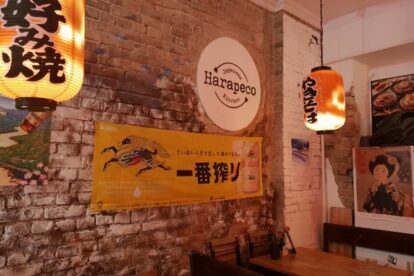 Harapeco also offers some non-traditional versions of Okonomiyaki, such as the ‘modern’ one with noodles added into the dough, or vegan/vegetarian options.